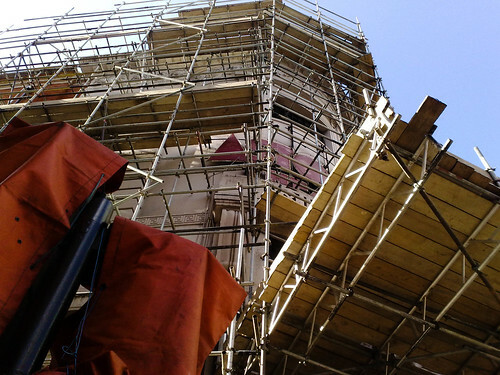 Scaffolding engineering companies are in the business of designing scaffolds that are tailored to meet the specific requirements of their clients. Scaffolding is particularly important in building construction, as it enables the workers to effectively carry out a variety of functions like painting, cleaning, and repairs among others. It offers flexibility and safety while moving and performing the various construction-related duties. Scaffold structures are mostly made of steel or timber. There are various types of scaffolding designs, which can be tailored to fit the diverse kinds of buildings irrespective of their height or shape. Below are some common types of designs that are offered by scaffolding engineering firms. This type of scaffold is constructed together with a building. It has rows of standards or vertical poles that are connected by horizontal ledgers or pieces and transoms. Since an independent scaffold has uprights or standards on the sides of the working platforms, it is able to remain upright without any support from the structure or building under repair or construction. However, extra support can be provided by tying or securing the scaffold to the construction building at different intervals. This type of scaffold is designed to be used on one level only, like in ceiling jobs. This scaffold design features one row of standards or poles. A single pole scaffold depends on the structure under construction or repair for much-needed support. This is a kind of independent freestanding scaffolding engineering design. The scaffold is mounted on wheels or castors that swivel. This allows the structures to be moved around easily from one place to another. This type of scaffold design has a free hanging or suspended platform that can either be lowered or raised. This design is commonly used to clean the outer parts of windows on tower blocks or high-rises. This scaffolding design has a somewhat complex framework made of horizontal components that are held up or supported by the building’s floor or other structures under repair or construction. Hanging bracket scaffolds must be designed by a professional engineer, as part of their construction involves load testing among other safety checks. Posted in News | Comments Off on Which Type of Scaffolding Tower Is Best For You? One of the leading manufacturers of formwork in Europe are celebrating after their hard work came to a conclusion at the European Championships in Poland and Ukraine. PERI, a German supplier of formwork and scaffolding systems, were a crucial factor in the building of the eight venues at the Euro 2012 football tournament. The construction company have reasons to be proud of their work with the event playing host to one of the most compelling and exciting football championships in many years. Five of the eight venues were specifically built for the event while the other three were reconstructed – all of which were aided with the help of formwork and scaffolding. Stadiums included the Polish venues of Wroclaw, Gdansk, Poznan and Warsaw while Ukraine saw enhancements to Kharkiv, Donetsk, Kiev and Lviv. The biggest of the new stadiums is that of the National Stadium located in Warsaw which saw development begin in 2009. Holding a 56,000 capacity, the ground entertained the first game of the championship between Poland and Greece and also hosted the semi-final tie between Germany and Italy as well as three other matches. England were knocked out of the tournament by Italy in the reconstructed Olympic Stadium in Kiev which now holds over 64,000 thanks to the use of formwork. Posted in News | Comments Off on Merry Christmas to all our customers! Posted in News | Comments Off on Welcome to the new Unit Plant Website!